2Wheel Chick: Wanna do the Giro della Penisola Sorrentina e Costiera Amalfitana ? Wanna do the Giro della Penisola Sorrentina e Costiera Amalfitana ? 1. This is a fairly small event by gran fondo standards. In 2007 there were 700 competitors. Having said that it was still treated as a big event in the local Sorrento/Massa Lubrense area. Many Italians had travelled from distant parts of Southern Italy to do this event. 2. A few people from the organising committee spoke English, but this was largely an Italian event with no other riders from the UK present. There were a few people of Central European origin there (who seemed to bag the prizes) but apart from them I did not see any other non-Italians. 3. It is therefore worth knowing a little more than a smattering of Italian when doing the event. On the other hand, when staying in nearby Sorrento this town is quite touristic (and also popular for Conferences, Congresses etc) with alot of Americans around so you can get by ok without knowing much Italian. 4. It is possible to enter in advance by filling out their form, faxing it and sending a direct bank transfer. However, it is possible to enter in person 2 days before the event (on the Friday) by going to a designated venue which is mentioned in the pre-race blurb. Failing that if you telephone the organiser he can arrange to meet you and do your entry for you. He'll also brief you abit on the race - which is how I did it. 5. As this is a big cycling event in the area many of the local cafes, bars, cycle shops and other shops will have posters advertising it. 6. Registration takes place the day before the event. Get there either very early or very late. At other times the place is very busy and a bit chaotic. Hey, this is Southern Italy !! 7. The goody bag is generous - there's alot of local produce - wine, limoncella, pasta etc. 8. There's nowhere to leave belongings while you ride so just go with what you need (if riding) or leave stuff in your car. 9. 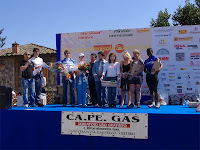 In 2007 the race start was at Sant'Agata sui due Golfi. I rode up there from Sorrento. It was a 5 mile ride uphill ride on a twisting road. I was nicely warmed up by the time I got there ! 10. The course was rolling, with 2 significant climbs - one of around 10km at 5%, the other of 5km at 8%. Apart from that there was nothing especially challenging. With the course following the most famous parts of the Amalfi coast you were constantly treated to amazing views during the ride - no chance to get bored ! 11. The 118km are treated more like a glorified road race by many, with the winner finishing in a bit more than 3 hours. The cut-off time is generous though, with people being given up to 6 hours to complete the distance. 12. There were 2 feedstations along the way - well stocked with food, though it's worth taking your own preferred energy nutrition in case they're serving stuff you're not used to. 13. The race, especially in the early part goes through small touristic towns that are generally busy but this is ok as there are police outriders that close the roads so you get a free run through the town. 14. The post race meal is generous and takes place in a cafe style format outdoors. They have a stage built specially for the prize presentation. 15. Prizes are very generous. The winning guy got a Viner Bikes frame and a weekend for 2 in Sorrento. The winning woman got a prize of similar value. As not many women took part all of us got prizes and had our moment of glory on the stage too ! 16. I would recommend this event because it's a chance to do an event in Southern Italy along the stunning and dramatic Amalfi Coast and it's good value for money. The organisers are very friendly and welcoming, and are keen to have their event appeal to people as far afield as possible. This is a good early season cyclosportive and being in Southern Italy the weather is going to be warmer than many places in Northern Europe.